Amoebas are simply single celled organisms. As such, they can only be viewed using a microscope. There are methods that can be used to observe these organisms. The first and simplest methods involves viewing amoebas under the microscope without staining. This is a simple method that allows students to view them live as they move around. The second method involves fixing and staining to get a better view of the structure and organelles of the organism. Amoebas can be found freely living and thriving in shallow pond waters with organic material. For this technique, the student may either observe a sample of pond water directly to identify the organism or conduct a simple culture to grow and increase the number of amoebas. When viewed, amoebas will appear like a colorless (transparent) jelly moving across the field very slowly as they change shape. As it changes its shape, it will be seen protruding long, finger like projections (drawn and withdrawn). For this technique, the specimen (amoebae) is first cultured using such culture and saline agar slopes. Following the culture, a sample of the specimen is further concentrated using a centrifuge (at 3 Krpm for about 10 minutes). Staining the amoebae is aimed at enhancing visibility of the mitotic figures. After staining, mount the slide on the microscope stage to observe. When viewed under the microscope, students will notice tiny dark spots in the cytoplasm of the organism while the cytoplasm is lightly stained. * Direct observation of the organism (without staining) has a great advantage in that the amoebae are still alive and motile when being viewed under the microscope. This allows the students to see the finger like projections (pseudopods) elongate and shorten as the organism moves about or engulfs given substrates. However, this technique does not allow students to view the cell’s organelles. Fixing and staining on the other hand kills the amoeba, which means that students will not get to see the organism moving in the field of view but staining increases contrast, allowing students to get a better view of the organelles in the cell. As mentioned, amoebae are eukaryotes, which simply means that they have a cell membrane surrounding their cytoplasm and DNA that is properly packed in the central nucleus. 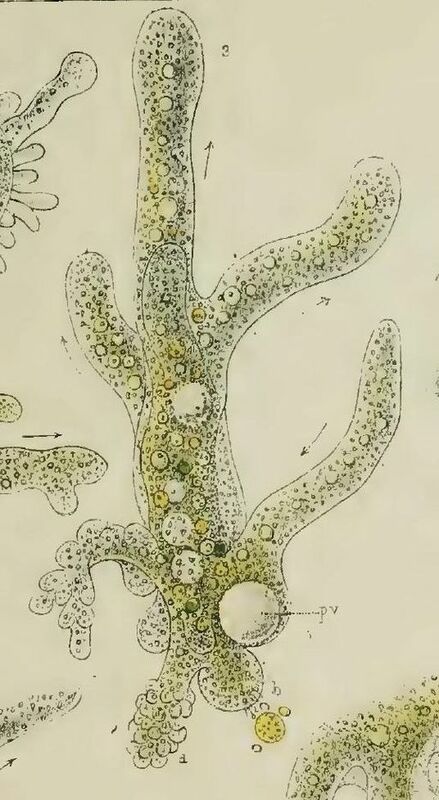 When viewed under the microscope, these aspects of the organism are clearly visible particularly when the sample is stained. * With regards to their structure, amoebae closely resemble cells of higher animals like those of human beings. Essentially, Pseudopodia are temporary projections of the cytoplasm that make it possible for amoebae to move. 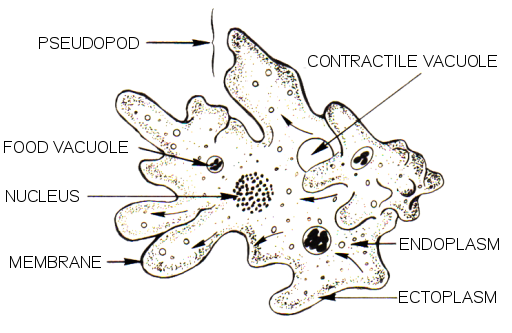 Pseudopods are some of the most distinguishable features of amoebae and their formation is based on the flow of the protoplasm. The organism contracts in a manner that pushes the cytoplasm to fill and expand a pseudopod while pulling at adhesions at the back of the cell. With pressure from ectoplasm, which is an exterior gel, endoplasm (interior fluid) is forced to flow forwards in the cell. On reaching the tip of the membrane, the pressure causes the endoplasm to form a pseudopod. The endoplasm is then forced back towards the ectoplasm and turns to gel (this causes the new pseudopod to disappear) The new gel is again converted to endoplasm and again under pressure moves to the membrane to form a new pseudopod. 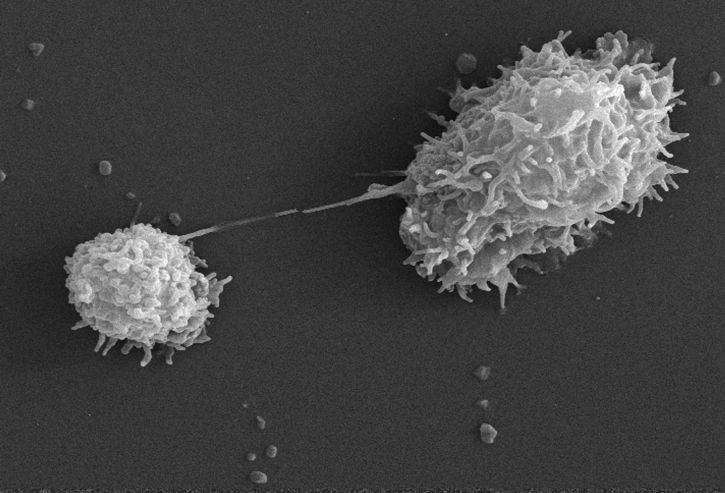 Apart from using pseudopod to move around, amoebae also use them to engulf food particles. Here, the pseudopod surround the particle while an opening on the membrane allows the particle to move into the cell and into a food vacuole where it is digested by enzymes. Kwang Jeon (1973) Biology Of Amoeba.